Yoink. The Saints have plucked linebacker Travis Feeney off of the Steelers’ practice squad, according to Ian Rapoport of NFL.com (on Twitter). The deal will be finalized upon completion of a physical exam. The linebacker exploded as a senior at Washington, tallying career highs in tackles for a loss (17.5), sacks (8.0), and forced fumbles (3) to go along with 56 total tackles. 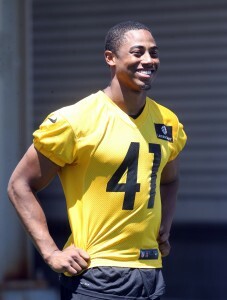 In the spring, the Steelers selected him in the sixth-round. Feeney just missed the Steelers’ 53-man cut in September, but he signed on with the practice squad soon after. After patiently waiting to see NFL action in Pittsburgh, he’ll instead get his chance with the Saints, a team that was eyeing him heading into the draft. Feeney is expected to provide depth and special teams help for New Orleans. If active, he may make his NFL debut against the Bucs on Sunday. The Steelers have reduced their roster to the league-mandated 53 players. As Fowler observes, the Steelers’ recent wave of offensive lineman cuts could be good news for B.J. Finney, who came into today firmly on the roster bubble. Feiler, like Feeney, is a practice squad candidate. Hooks, an Ole Miss product, was signed by the Packers as a UDFA following the 2015 draft, but Green Bay cut him last August as part of the 75-man cutdown. He caught on with the Steelers in February, and at least made it to the final cutdown day, so that qualifies as progress. Ahmed was part of the Falcons’ crop of UDFAs this year but was waived by Atlanta last month. The Temple product made the switch from defensive lineman to offensive lineman during his junior year, and he started 12 of 13 games at left guard for the feel-good Owls last year. Josh Norman‘s signing with Washington will likely lead to Will Blackmon making the move to safety, Mike Jones and Master Tefatsion of the Washington Post write. Blackmon started 10 games at corner last season. Although Washington signed David Bruton to compete for a starting safety job this offseason, the team has questions on the back line. Kyshoen Jarrett‘s status is unknown after a season-ending injury, and career-long corner DeAngelo Hall‘s full-time transition to the position will come in a season where he turns 33. Jones and Tefatsion also point out that Bashaud Breeland looks like the favorite to start alongside Norman for Washington this season, since 2015 free agent acquisition Chris Culliver‘s $8MM base salary is non-guaranteed. Washington would take on $3.75MM in dead money if the club decides to release Culliver, Pro Football Focus’ second-worst full-time corner last season. Speaking of Breeland, when he first heard the news that Norman was heading to Washington, he “took it as disrespect,” he admitted during an appearance on SiriusXM NFL Radio (SoundCloud link). However, he came to view the signing as a “chess move” that will not only improve the team, but could also allow Breeland himself to improve by working with one of the league’s best corners. Landing Norman shouldn’t negatively impact Washington‘s chances of getting a long-term deal done with quarterback Kirk Cousins or any of the club’s other key contributors, writes John Keim of ESPN.com. Panthers running back Cameron Artis-Payne was arrested after police recorded him driving 102 mph in a 65-mph zone, per WSOCTV (on Twitter). The Eagles brought in Auburn cornerback Blake Countess for a pre-draft visit last week while clubs were still permitted to host prospects, according to Tony Pauline of DraftInsider.net (Twitter link). The Saints held pre-draft visits with Washington linebacker Travis Feeney and Nebraska offensive lineman Alex Lewis, reports Joel Erickson of the Advocate. Both prospects project as Day 3 picks, and Lewis is particularly interesting as the college tackle could be moved inside to guard at the pro level. The Titans, who hold the top pick in this year’s draft, have scheduled a visit with Florida State defensive back Jalen Ramsey, writes Chase Goodbread of NFL.com. Most expect the Titans to take Ole Miss offensive tackle Laremy Tunsil first overall, but they’re nonetheless doing their homework on Ramsey. Should Ramsey get past the Titans, he’ll have a potential suitor in the Cowboys, who pick fourth and have already met with him, tweets Rand Getlin of NFL.com. More draft news. . . In addition to his previously reported visit with San Francisco, Clemson cornerback and prospective first-round pick Mackensie Alexander will meet with the NFC West rival Rams, according to Jeremy Fowler of ESPN.com. Alabama cornerback Cyrus Jones worked out for the Ravens on Friday, as Jeff Zrebiec of The Baltimore Sun tweets. Jones, who projects as a slot cornerback and a return specialist, is viewed as a third- to fourth-round pick. The Baltimore-area native has said that playing for the Ravens would be a “dream come true.” In total, the Ravens had about 40 to 50 players in for a workout, including Jones and two Maryland defenders – Sean Davis (DB) and Quinton Jefferson (DT) – Zrebiec tweets. The Steelers hosted four prospects Friday – safeties Deon Bush (Miami) and Jeremy Cash (Duke), Georgia Tech cornerback David White, and LSU offensive lineman Jerald Hawkins – per Mark Kaboly of the Pittsburgh Tribune-Review. Hawkins is the second O-lineman the Steelers have met with over the last two days, joining Indiana’s Jason Spriggs (link via Tony Pauline of WalterFootball.com). The Buccaneers sent offensive line coach George Warhop to Cincinnati on Friday to work out tackle Justin Murray, reports Greg Auman of the Tampa Bay Times (Twitter link). The Vikings had an assistant spend time on Thursday after Washington’s pro day with linebacker Travis Feeney, Darren Wolfson of 1500 ESPN tweets. Feeney had a strong showing at the combine but, unfortunately, had to undergo hernia surgery afterward. Miami defensive lineman Ufomba Kamalu has picked up interest from the Chargers, Panthers, Eagles, Cardinals, and Broncos, according to Mike Kaye of First Coast News (via Twitter). The Titans and Vikings met with Indiana defensive tackle Darius Latham on Friday, Pauline reports. Off-field issues, including two suspensions in college, could hurt Latham’s draft stock. If not, he might go as high as the third round. UTEP defender Roy Robertson-Harris is drawing attention, having met with the 49ers and Panthers. He also has visits and/or workouts scheduled with the Raiders, Chiefs, Bears and Vikings.